← MISTRIAL FOR COP IN BALTIMORE’S FREDDIE GRAY CASE; WERE THE REAL PERPETRATORS PROSECUTED? Protest against Wells Fargo’s fraudulent practices. 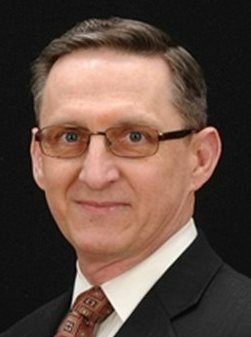 Hathaway related to new Wayne County Treasurer Richard Hathaway, who oversees Register of Deeds–should he recuse himself from sentencing? Investigator Mary Jones previously was with Detroit Police Department for 25 years. 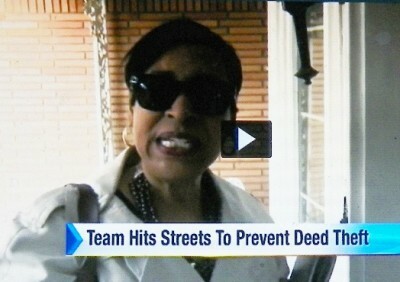 Photo from WDIV online video. 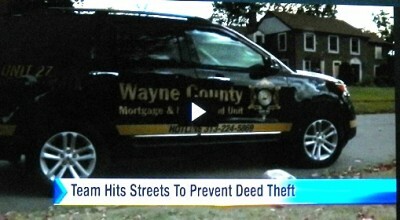 Detroit – WDIV Channel 4 aired a report Dec. 16 on the Wayne County Mortgage and Deed Fraud Task Force, showing its glitzy new SUV, driven by Investigator Mary Williams Jones, roaming Detroit streets to nab “deed thieves.” Prior to her five years on the task force, Jones retired from 25 years in the Detroit Police Department. “Unfortunately we’ve had to investigate I think about 2500 cases and we’ve returned about 190 homes [over the last 10 years],” Wayne County Register of Deeds Bernard Youngblood says in the report. Meanwhile, neither Wayne County, the City of Detroit, nor the State of Michigan have investigated, sued or jailed representatives of the banking industry, which has caused the loss of at least 237,000 homes in Detroit alone to illegal mortgage foreclosures based on predatory lending, a national practice which led to the 2008 global economic meltdown. Mrs. Stafford was convicted of “False Pretenses over $20,000” which carries a maximum sentence of 15 years, and both Staffords were convicted of “Obstruction of Justice,” a misdemeanor. The Staffords’ attorneys contended at trial that neither of them was involved in transacting a $395,000 mortgage with Wells Fargo for a home in Belleville, in 2007 during the height of the predatory lending frenzy which led to the 2008 global economic collapse. 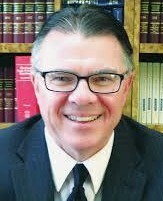 Wayne County Circuit Court Judge Michael Hathaway, however, told the jury they could convict the Staffords of “aiding and abetting” other uncharged parties, although those terms are not in their charges. The Staffords face sentencing Jan. 13, 2016. They are asking all those they have helped through the years, and all who oppose illegal foreclosures, water shut-offs, and other crimes against the people, to support them and to attend. Watch out–this car may be coming for YOU, not the global banks which have destroyed Detroit. Judge Hathaway likely should recuse himself from the rest of the trial including sentencing, since his relative Richard Hathaway was appointed Wayne County Treasurer Dec. 11. The Treasurer oversees the Register of Deeds, whose Task Force targeted the Staffords. 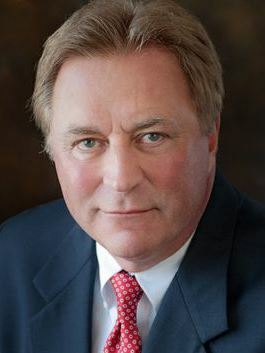 Richard Hathaway previously served as Chief Assistant Prosecuting Attorney under Wayne County Prosecutor Kym Worthy, who nominated him for Treasurer. 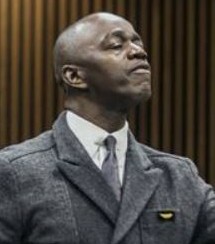 Hathaway clearly steered the jury toward the Staffords’ convictions through his jury instructions, which lumped them in with uncharged parties including Wells Fargo, Fannie Mae, mortgage brokers, and title companies who perpetrated a scheme related to the sale of a house at 13236 Nautica in Belleville, MI. The defense contended the Staffords were unwitting dupes of these entities. “The evidence is clear that there are a number of wrongdoers here,” Hathaway said. “There could have been others guilty of deliberate wrongdoing.” He instructed the jury that it could decide whether the defendants “aided and abetted” the uncharged parties as part of the original charges against them. The Staffords’ attorneys Patrick McQueeney and Steve Lockhart objected in part to the instructions after the jury decision. During jury selection, Wayne Co. Assistant Prosecutor Jennifer Douglas weeded out homeowners who would have been familiar with mortgage practices. Hathaway also severely berated an older Black woman juror for showing up at 9:15 am on the third day of the trial, gave her no chance to explain, then removed her, further changing the composition of the jury and possibly intimidating other jurors. Jurors had been coming in at 10 a.m. every other day in the trial. Hathaway told the juror she should have been there for the testimony of Attorney Antonio Tuddles at 9 a.m., which Hathaway had rescheduled from 3:45 pm the day before. Tuddles, scheduled to testify about a quiet title lawsuit he argued for the Staffords, showed up at the scheduled time of 3:45 pm the previous day. Hathaway conducted an ex parte discussion at the bench with him for 10 minutes, then rescheduled his appearance for the following day at 9 a.m. It is not known what transpired between Judge Hathaway and Tuddles during their conversation. But the next day, Tuddles testified only briefly that he would not have pursued a “frivolous” lawsuit. He did not testify to more extensive events he put on the record in a case evaluation filed in Dec. 2010. His testimony on those events may have influenced the jury in the other direction. http://voiceofdetroit.net/wp-content/uploads/Case-evaluation-4.pdf. 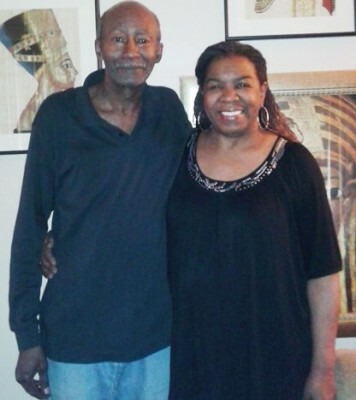 The Staffords, who have four children, lived for 25 years on Gilchrist on Detroit’s northwest side, where Mr. Stafford was president of the neighborhood block club. The Wyldons were their neighbors. They run a low-profile company called Private Consumer Consulting Services, LLC. Mrs. Stafford and her friend Anita Brown began the company as a DBA called PCCS/Consumer Advising during the 2007-08 economic crash. 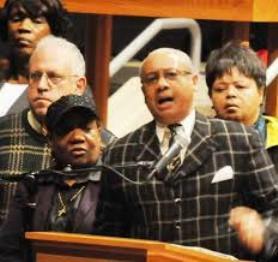 Mr. Stafford and witness Jammi Muhammad, both retirees from Ford Motor Company and U.S. military veterans, testified that PCCS, LLC was founded in February, 2008, to assist and educate people facing the thousands of foreclosures that devastated metro Detroit before, during and after the crash. 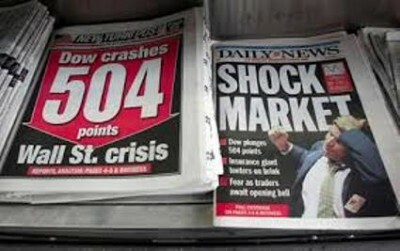 Global economic crash of 2008 caused by predatory lending practices of global banks, mortgage companies. “As veterans, we wanted to give back to the community,” Muhammad said. To raise capital for the organization’s functions, it bought and sold various properties. Its members hoped to make some profit by selling them after renovation or after equity accrued. Uncharged parties in Nautica ripoff: Wells Fargo, Fannie Mae, Valerie and Kevin Kauth, Avis Washington, Glen P. Boggess, Jr. The Staffords’ trial produced abundant testimony alleging criminal wrongdoing against uncharged institutions and individuals. 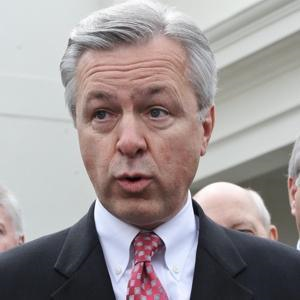 These included Wells Fargo for loaning the inflated amount of $395,000 to Trenise Wyldon without a valid title, title and mortgage insurance, and other closing requirements during the height of the predatory lending bubble, according to defense expert Richard Woonton. Donny and Joann Carlton had sold the house to PCCS for $312,500. Fannie Mae later also foreclosed, compensating Trenise Wyldon, the alleged owner listed on the allegedly invalid title, for $2,000. They sold the property on July 18, 2013 for $273,000. Other uncharged parties include the short-lived Reliant Title company (founded in March, 2006 and dissolved in April, 2009). Brokerage NOVA 2000 with its DBA Loan Origination Concepts (LOC) illegally worked with Reliant Title, even having employees in common, to finagle the deal, according to testimony at the trial. Kevin Kauth was President of Reliant Title, and Valerie Kauth signed, endorsed and notarized documents in the Nautica deal, including the deed allegedly signed by Mrs. Stafford. She even endorsed a check made out to PCCS, which she had no membership in, according to a prosecution exhibit. Avis Washington, according to her testimony, was guilty of a serious conflict of interest during the transaction. She worked for both Reliant Title and brokerage NOVA 2000/LOC. 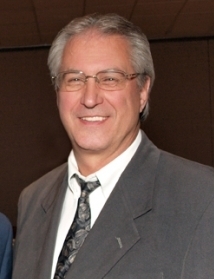 Glen P. Boggess, Jr. was president of NOVA 2000/LOC. It was incorporated in August, 2004 and is noted in state records with an “automatic withdrawal” in July, 2011. 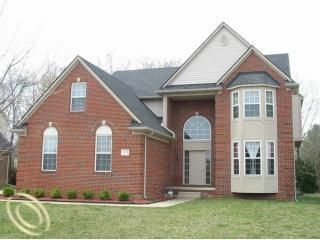 Disputed property: 13236 Nautica, Belleville, MI. Witness Jammi Muhammad testified that he and Clifford Stafford discovered the fraud perpetrated on them when he went by the house and saw another real estate agent with a couple getting ready to sell it. As an employee of Reliant Title and NOVA 2000, she said she did not work out of an office, conducting her work from her home, primarily over the phone. She said she could not remember the names of any co-workers. Mr. Stafford said during his testimony that it was Avis Washington who took him and others to see the Nautica house, along with other properties. They included a house on Country Ridge in Farmington Hills, which he said was purchased by Emmett and Trenise Wyldon. He said Washington and Boggess used to attend some of the early PCCS open meetings, but were not members. Central to the prosecution’s case was its second exhibit, a signed Warranty Deed ALSO dated Dec. 5, 2007, conveying the house from Mary Ann Stafford, d/b/a PCCS, to Trenise Wyldon, a former neighbor of the Staffords, for the inflated amount of $395,000. Deed Staffords contend was forged. 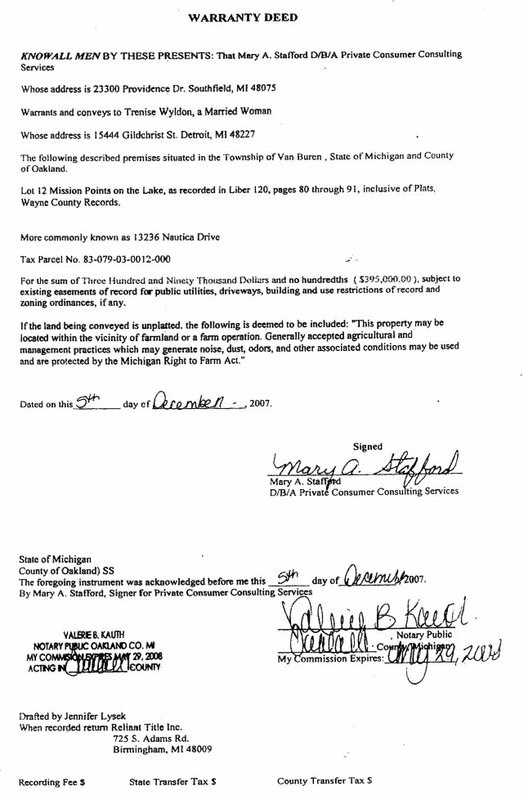 Tuddles said in his case evaluation, “When comparing the handwriting on the fraudulent document to Mary A. Stafford’s original handwriting, you can see that someone tried to duplicate her handwriting.” He attached copies of her driver’s license and Michigan State ID. Mary Ann Stafford has strongly denied in various statements that it was her signature on the deed. Thomas Riley of MSP forensics lab. Douglas relied heavily on the testimony of Investigator Jones and Thomas Riley, a questioned document examiner for the Michigan State Police forensics lab. Riley testified that he had instructed Jones to obtain 30 “exemplars” of Mrs. Stafford’s signature on documents SIMILAR to the warranty deed. He said Jones sent him a package containing a COPY of the warranty deed, along with 30 exemplars. Since the questioned document was a copy, he said he gave a “qualified” decision that no differences were noted in all the signatures. 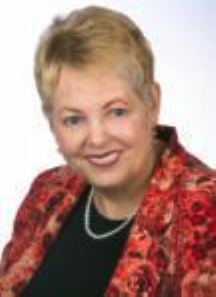 Both Riley’s and Jones’ practices were tainted, likely deliberately, according to an article title “Collecting Exemplars” by Certified Forensics Document Examiner Katherine M. Koppenhaver, founder of the International Association of Forensics Document Examiners. Jones testified that she took the original Warranty Deed, and whited out the signature, apparently destroying a critical piece of evidence. She said she Xeroxed 30 copies of it, and then had Mrs. Stafford sign the 30 copies, in direct opposition to Riley’s instructions to use SIMILAR documents. It was unclear from her testimony whether the warranty deed which Douglas showed on the screen with Mrs. Stafford’s signature, purporting to be a copy of the original, was actually one of the 30 copies of the same deed that Mrs. Stafford signed as exemplars. The document had a line down the middle, like that produced on a copy when a Xerox machine is running out of ink. Informal samples are those which already exist, taken from documents earlier executed in the regular course of business, while request writing is that which the signer is asked to execute by the examiner. Koppenhaver says it is preferable to have the examiner (i.e. Riley) carry out the collection of request exemplars. Instead, Jones, not trained in document examination, collected the request exemplars. Rev. Edward Pinkney with wife Dorothy at his left, during first rally against Michigan Gov. Rick Snyder’s emergency manager act, PA 4. It later became PA 436. Riley never testified that he requested the original document. Earlier, in the case of Rev. Edward Pinkney, now jailed on allegations of falsifying dates on election recall petitions, the MSP forensics document examiner testified he also examined copies. Based on the allegedly fraudulent deed, Wyldon then procured a $395,000 mortgage from Wells Fargo Bank, also dated Dec. 5, 2007. Wyldon falsely claimed on her credit application that she had worked for PCCS for “2-6 years,” and was making $10,000 a year. The Staffords disputed Wyldon’s claim, saying PCCS as a voluntary group never had employees, and specifically that it did NOT employ Wyldon or her husband Emmett Wyldon. They say Wyldon was unemployed. Wyldon pled guilty to a charge of “False statement on a credit application” Jan. 13, 2014, based on a settlement offer that she would “cooperate with ongoing deed/mortgage fraud investigations and testify truthfully when subpoenaed to do so.” The offer recommended no jail time. 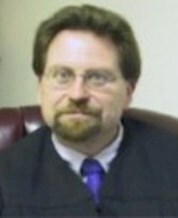 Without a hearing of record, Wayne County Circuit Court Judge James Chylinski signed off on a dismissal of the charge against Wyldon Aug. 20, 2014. Wyldon showed up for the preliminary exam of the Staffords, but never testified, and was not present during their trial. They were given no warning when they went to the Task Force offices at 400 Monroe that they were actually walking into the lion’s den. Jones testified on cross exam that Mr. Stafford had come into the office prior to her interview for an intake session. She then typed up what appeared to be leading questions for her interviews with both Staffords, and had them respond in handwriting. The Staffords were not warned they were being considered for prosecution, and had no attorneys present. The Wyldons resided in the Nautica property for two years. It was then foreclosed by Wells Fargo and sold to Fannie Mae. Wells Fargo got its money back with interest from the FDIC, and Reliant Title, including representatives Glen Boggess, Ava Washington, and Valerie Kauth walked away with their fees. 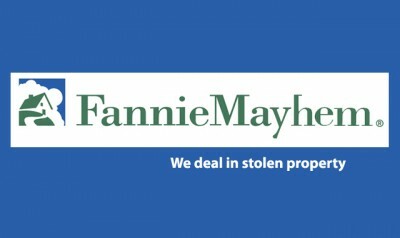 Without proper title investigation, Fannie bought the property and later sold it for $273,000. Clifford Stafford said PCCS made “not one red cent” on Nautica deal. 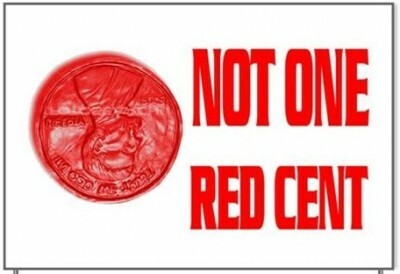 PCCS made “not one red cent” on the transaction, Mr. Stafford testified. In fact, he said PCCS had paid numerously monthly mortgage costs for the property while the Wyldons lived there, not knowing that Trenise Wyldon had fraudulently conveyed the property to herself alone. Richard Woonton, called as an expert witness for the defense, testified that the $395,000 mortgage package for Trenise Wyldon and other documents were severely flawed. He said he was testifying pro bono, i.e. he had received no fees for his work on the case. Woonton said he is licensed as a mortgage loan officer for the State of Michigan and 38 other states. He said he began his career in 1982, clearing up bad loans, corruption and fraud, and authenticating various documents. The defense produced a purchase agreement dated Sept. 13, 2007, signed by Avis Washington on behalf of Glen Boggess for the Nautica property. The amount cited was $322,500, not the amount of the mortgage obtained by Wyldon. Woonton said the signers are supposed to be the sellers and the buyers, not Avis Washington, who processed the purchase agreement. Hathaway asked him whether purchase agreement signers sometimes back off later, but Woonton testified the agreement was part of the entire Wells Fargo bank file. He said certificates for mortgage and title insurance were not included in the Wells Fargo package, and that the HUD settlement agreement didn’t have an address where the closing took place. He said it also falsely identified PCCS as the sellers. A little sloppy? Wells Fargo CEO John Stumpf. “It was the Carltons whose Bank of America loan that Wells Fargo paid off,” he testified. He added that after Wells Fargo supplied the money for the loan, Reliant Title issued a check to PCCS for $67,000. That check was however endorsed by Valerie Kauth, ending up in the title company’s escrow account. He said Reliant Title then illegally issued a $23,143 check to Trenise Wyldon, money which she supplied as the down payment on the house, asserting that it was from her own funds. He said return of the original documentation of the mortgage must go to the company that owns it, which was Wells Fargo. However, he testified that on the document in question, “Wells Fargo” is crossed out as the returnee, and fraudulently replaced by Reliant Title. This entry was posted in Uncategorized and tagged AdvocatesforBaxter, bankfraud, Beatbackthebullies, biasonthebench, CliffordStafford, forgery, FreeRevPinkney, FreetheStaffords, JudgeMichaelHathaway, MaryJones, MaryStafford, mortgagefraud, mortgagemeltdown, questioneddocument, toobigtofail, unjustconviction, WayneCoROD, WayneCoTreasurer. Bookmark the permalink. Big misrepresenttion in the article. The FDIC does not pay any financial instution (bank) for any losses on a mortgage or any consumer loan. The FDIC only comes into play when it covers the bank customer deposits in their (customer’s DDA or savings accounts). An error like this makes the entire article suspect. Reporter needs to get their facts straight. Yes, you are correct, and the article is mistaken. Wells Fargo informs us they had private mortgage insurance. Thank you for the correction. Mortgage Servicing Fraud occurs post loan origination when mortgage servicers use false statements and book-keeping entries, fabricated assignments, forged signatures and utter counterfeit intangible Notes to take a homeowner’s property and equity. This is accomplished by using one or more of the following tactics. 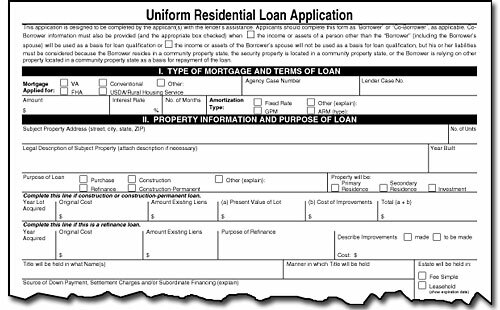 Request homeowners to submit and resubmit loan mod paperwork multiple times that pays the bank $1,500 each time. Thank you for this extensive list, which applies primarily to corporate and banking forces. Only a List of Wells cases… all the other Banks are on this page too along with all the active links to the cases/articles/exhibits. Wells Fargo v. Erobobo (noncompliance with the assignment provisions of a Pooling and Servicing Agreement voids the assignment of a note and mortgage (4/13). 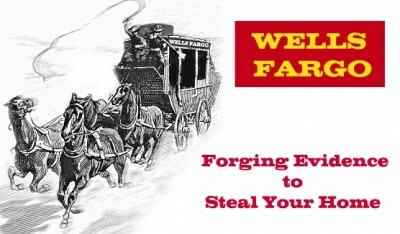 Thank you for focusing on the crimes of the banks, particularly Wells Fargo. VERY WELL COMPOSED AND WRITTEN ***DIANE*** !! THE EVIDENCE IS IN FAVOR OF THE PUBLIC, NOT THE BANK ???? THE QUESTION NOW IS “DO WE HAVE A DEMOCRACY IN DETROIT” ???? You borrow money you can’t pay back and should have known you couldn’t pay back when you borrowed it – that is the banks fault??? BS! Apparently you didn’t read the article clearly. The Staffords borrowed NO MONEY for the Nautica property. Trenise Wyldon did. As far as your argument blaming homeowners who ended up not affording predatory loans, it was the banks which foisted those predatory loans on families across the country, leading to the global economic meltdown of 2008. This particular Wells Fargo loan was part of the whole predatory lending frenzy. Banks across the globe have been sued by the U.S. Dept. of Justice and numerous other entities for these practices, and some bankers have gone to jail. Then the U.S. government rewarded the same banks with trillions of OUR tax dollars because they were “TOO BIG TO FAIL.” Well, they are not TOO BIG TO JAIL. Exactly where have YOU been for the last decade? Forgot to mention, Bob, that the banks profit handsomely from foreclosing, as the article points out Wells Fargo did. They are insured and get the whole amount of the mortgage back, plus interest, so it is more profitable to them to foreclose then to adjust payments to affordable levels, as the federal TARP act required them to do. Only 6 percent of homeowners ever got such adjustments under the TARP act. What a wonderfully simplistic world you must aspire to live in. Ever hear of a con game? Spend some time, study the issues… this is a con game run by the brightest of the bright… but they didn’t hardly cover their assses at all. Just one little tidbit of info for ya… it being Christmas and all.. in 2004, 11,000 Professionally Licensed Property Appraisers gave the FBI a petition, which they had all signed, stating that each had been contacted by the Big Banks and told if they did not over appraise properties from then on… they would get no more work. Look it up. Google it. hmmmm…. 2004…. that’s when the sub-prime market was just starting to flourish! Think Grasshopper…. just who DID start the housing boom? BTW… the FBI… pawns of the Banks that they are… did nothing.